Place the millet and 2 1/2 cups water into a saucepan. Bring to a boil, cover, and simmer until tender, about 15 to 20 minutes. Remove from heat and fluff with a fork. While the millet is cooking, heat 2 tbsp. water in a large, deep skillet. Add onions, mushrooms, pepper, and basil and sauté for about 3 minutes, until the onions soften. Add the cauliflower, salt, and garlic and cook, covered, stirring frequently for about 5 more minutes. The cauliflower should be approaching tenderness but not completely cooked. Add 1 tbsp. lemon juice. 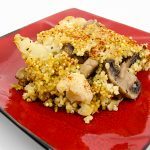 Mix the millet into the cauliflower, along with the prepared sauce. Press the mixture into an oiled (or sprayed) 9 x 13-inch pan, sprinkle paprika on top, and bake at 350 F for about 20 minutes, until hot but not dry. Cut into rectangles and serve.